You’ll begin your kayak fishing adventure against the breathtaking backdrop of seemingly endless marsh grass and tidal rivers. Our meeting place for the day will be determined based on the tides, wind and time of year of your trip. Each change in tides provides a completely unique fishing experience, venturing into the mud flats at low tide, or looking for redfish feeding on fiddler crabs in the tall grass at high tide. Each day of kayak fishing is a completely new adventure, so come prepared for an incredible experience. 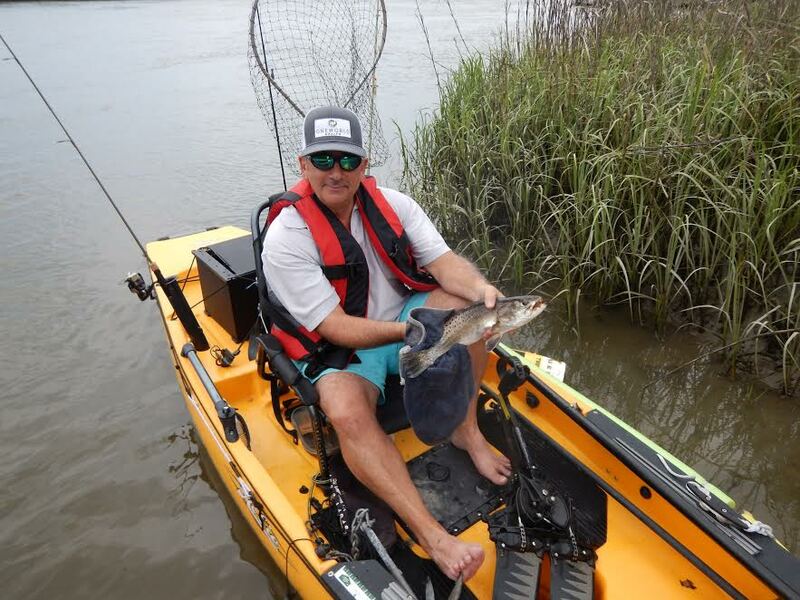 The star of the Hobie Pro Angler is the unique pedaling system that allows you to be totally in control of maneuvering the boat yet your hands are completely free to fish. The star of this system is the Mirage Drive Pedal. Once we launch our Hobies from the ramp, I’ll provide a quick tutorial on the features of your boat and safety issues. Within just a few minutes, you’ll find your sea legs and we’ll head into the marsh in search of our fish target for the day. As we pedal our way into the Lowcountry marsh, we’ll be on the lookout for schools of feeding redfish and trout. Whether you’re an experienced fisherman or a first-timer I’ll provide just the right support you need to have a successful day. As we make our way into the tall grass, you’ll have access to areas and fish that power boats can’t access. Enjoy seeing a variety of local marine life like loggerhead sea turtles and American Wood storks which are both on the South Carolina Endangered Species list. If you’re lucky, you may see Atlantic Bottlenose dolphins as pods of dolphin are very common in the warm tidal creeks. You’ll marvel at the salt marshes that are home to marsh cordgrass or spartina, a wispy strong grass that’s the only plant that can grow successfully while fully submerged in salt water. It’s found along the coastline in the tidal flats and serves as a barrier between the ocean and the marshes as well as a food source for many marine animals and insects. Book now to lock in your dates.